Michael Richens says Kettering Town should be delighted with their start to the season, despite suffering disappointment in midweek. 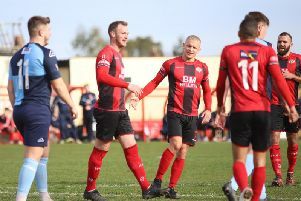 The Poppies went into the clash with in-form Redditch United on the back of four successive wins, which had seen them open up a five-point advantage at the top of the Evo-Stik League South Premier Division Central. By the end of Tuesday evening, however, that gap was down to the three after Kettering were held to a 4-4 draw at Latimer Park while second-placed Stourbridge claimed a 2-1 victory at Biggleswade Town. The Poppies were uncharacteristically shaky at the back on Tuesday and trailed 3-2 at half-time before two goals from Dan Holman looked to have put them on course for another win, only for Redditch to grab a deserved point when they scored from a corner in the final minute of stoppage-time. Nonetheless, Kettering remain three points clear with two games in hand on their nearest rivals and captain Richens insists that is a position they would have taken at this stage. “When you go 4-3 up after being 3-2 down, you think you are going to win the game and they have had one corner in the whole of the second half and we conceded from it,” the midfielder said. “All the lads had their heads down after the game but we just have to stay positive. “Redditch came here as an in-form team and we have played 15 games and we only have one loss. “If anyone had given us that at the start of the season then we would have taken it. That next test at the weekend sees Kettering taking on St Ives Town at Latimer Park. Kettering will be looking to get back on the winning trail to continue their fine form that has seen them victorious in 12 of their 15 league matches so far. And Richens, who headed home the winner in last weekend’s 1-0 victory at Rushall Olympic, believes the competition for places in the squad has been one of the main reasons for their success to date. “I think the strength of the squad has been the key for us,” he added. “We had a few injuries right at the start and that was probably our toughest period but we had to grind through it. “Now we have strength in depth, we are able to rotate players and everyone is fighting for a shirt. The combative midfielder, who enjoyed an impressive first season with the club last campaign, has taken on the captain’s armband and has led from the front. And he insists being handed the captaincy is a “good opportunity” for him. “I got the call to do it on the first day of the season and I was really honoured,” the 23-year-old said.